Only the Steam installer is included. 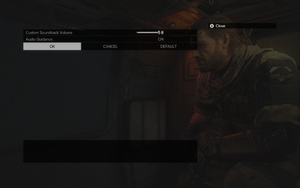 Save game data location is shared with Metal Gear Solid V: Ground Zeroes. 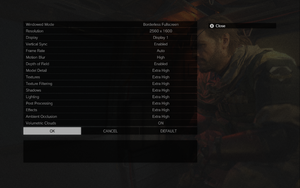 Save data from Metal Gear Solid V: Ground Zeroes can be "uploaded" (imported) with associated bonuses. Use the Widescreen Patcher. See the WSGF topic for other details. 26B41740 - 2560x1080, 8EE31840 - 3440x1440. See the WSGF topic for marker positioning fixes. FXAA only. Tied to the Post-processing setting. Edit fov.cfg with your desired horizontal FOV. By default, enabling Adaptive V-Sync in the driver control panel will disable V-Sync entirely on a 60 Hz display. Unlocking the framerate will fix this. Open TPP_GRAPHICS_CONFIG in the text editor of your choosing. Change the line "framerate_control" : "Auto", to "framerate_control" : "Variable", and save the file. 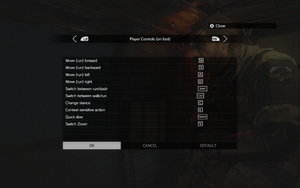 If you make any changes to the graphics options in-game, this preference will be reset. Affects camera/mouse input; Higher/variable FPS = higher/variable sensitivity. Can't use NumPad or symbol keys. Some of the iDroid controls use Q and cannot be remapped, which creates a conflict when using a ZQSD control scheme on an AZERTY keyboard. It's easier to just switch your keyboard to QWERTY. Under Control Settings, Mouse Sensitivity. Partial support. Left-clicking enters highlighted menu option while right clicking backs out of a menu. Presets only. Action and Shooter. Under Camera Settings, Camera Speed. Touchpad can be used perfectly just like PS4 counterparts. 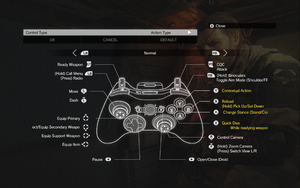 Use the DualShock 3 and 4 button icons mod. Option to adjust volume of custom soundtrack only. Choice between foreign languages or full (all speech) subtitles. Full subtitles on speech only, no true CC. This glitch occurs both on foot and in vehicle. Has a higher chance of occurring if the user frequently uses the Steam overlay and chat while in-game. Tap in the direction you are moving to stop. Pausing the game, tapping WASD (up, down, left & right for controller) then un-pausing will reset all camera and movement control back to normal. Minimising the game (Alt+Tab ↹) while using Fullscreen mode may cause shadows to become artifacted. There are plenty of reports on the web about complete loss of progress due to corrupted saves. Konami itself had acknowledged as much under certain circumstances, but it seems like it can happen at various times and still does. None. Either replace save game files with manually backed up ones, or with those from someone else. The MFPlat.dll error occurs on N/KN versions of Windows when the Media Feature Pack is not installed. Install the Media Feature Pack (Windows 10, Windows 8.1, Windows 8, Windows 7). Mother Base raids. Part of singleplayer campaign. 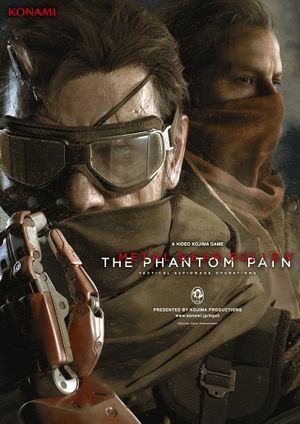 See Helix Mod: Metal Gear Solid V: The Phantom Pain. By default, you cannot disable FXAA while using Extra High post processing. Type MGSV_QAR_Tool data1.dat -r then press ↵ Enter. Inside the newly created data1 folder find gr_init_dx11.lua open it in your text editor of choice. 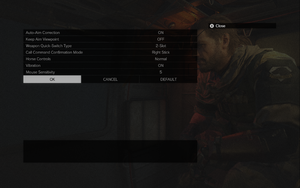 Save the file, then go back to the Commandline Window and type MGSV_QAR_Tool data1.inf -r then press ↵ Enter. As of patch 1.02+ Use the same steps to modify gr_init_dx11.lua in 00.dat file in the MGS_TPP/master/0/ folder instead. Open the NVIDIA Control Panel and go to the Manage 3D settings page. Highlight the Ambient Occlusion box and change the setting to Quality and then press save. While in-game disable Ambient Occlusion so that the NVIDIA Control Panel setting applies properly. Make sure you have Nvidia GeForce 355.82 or higher drivers installed. You must have not already completed the FOB mock infiltration tutorial. Begin Mission 21. Shortly after beginning, Kaz will tell you Mother Base is under attack (Mission 22). Accept and successfully complete Mission 22. Create an FOB when prompted. Alt+F4 when prompted again to perform a mock infiltration. In Windows, bring up Windows Firewall with Advanced Security. Right-click on Outbound Rules and create a New Rule. Enter the path to the game's executable (e.g. 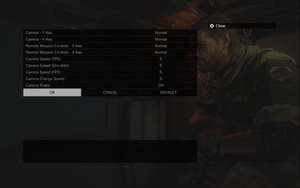 %ProgramFiles% (x86)\Steam\steamapps\common\MGS_TPP\mgsvtpp.exe), Next. Click Block the connection, Next. Load the game and play offline. Save data will continue to be synchronized by Steam Cloud. Only communication between your game and Konami servers is blocked. Wait for the game to fully load to the Press Enter Key screen. ↑ 1.0 1.1 File/folder structure within this directory reflects the path(s) listed for Windows and/or Steam game data (use Wine regedit to access Windows registry paths). Games with Steam Cloud support may store data in ~/.steam/steam/userdata/<user-id>/287700/ in addition to or instead of this directory. The app ID (287700) may differ in some cases. Treat backslashes as forward slashes. See the glossary page for details. ↑ graphμre | グラフ on Twitter: "Contents on disc for the physical retail PC version of #MGSVTPP: - Steam installer (8.78 MB) And... nothing else. http://t.co/TcFskpSZ8O"
↑ Metal Gear Online on Twitter: "FOB/Mother Base are aspects of the single player campaign of TPP"
↑ Metal Gear Online on Twitter: "@RashidSalem12 @bit_crusherrr its not currently planned, no"